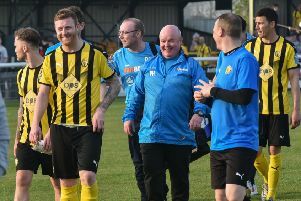 Leamington manager Paul Holleran says the importance of an FA Cup run is not lost on him. Brakes, who have failed to win successive FA Cup ties under Holleran, enter the competition tomorrow with a first qualifying round tie against Stamford AFC. And Holleran says the club’s lack of recent cup success is not for the lack of trying. “Preparation-wise we try to cover all the bases,” he said. “It’s the most important fixture in the first five or six weeks of the season and we do even more homework to prepare properly. “Win two or three games and you’re on a cup run. It’s fine margins. Visitors Stamford have provided value for money this season with their seven Northern Premier League matches to date producing 46 goals. The Daniels have shipped 25 of those and Holleran fully expects his side to take advantage of their defensive vulnerabilities. Brakes will be without Jake Jones and Rob Ogleby tomorrow as they serve suspensions for their red cards at Biggleswade. However, Holleran has been able to extend Will Green’s loan from Brackley, while James Fry is training with the club having completed his rehabilitation at Birmingham City following ankle surgery.